With gorgeous sunny weather and high temperatures from April to September, Marrakech is one of Morocco’s major tourist attractions. With so much to do and see there is something available there for the entire family. Whether you’re in search of art and culture, you want a few moments of peace and rest or you’re just there for the food, Marrakech has it all. Here, award-winning hotel Riad el Zohar take a look at the top ten things to do when holidaying in Marrakech and don’t worry, they’re all family friendly! Open 9 – 6:45 Wednesday – Monday, The Dar Si museum provides a unique insight into classical Moroccan life, with a stellar collection of crafts, woodwork, leather and weapons that have been rescued from the abandoned dwellings of old. The Maison de la Photographie is where you want to go to see around 8,000 photographs of 1870-1950’s Marrakech. It is a beautiful look into the ancient city. Marketplaces are amazing places to get lost in and the souks of Marrakech are no different. Wander through a huge range of stalls selling fruit, hot food, craft work, handmade children’s toys and a whole host of souvenirs ready to be taken home. Certainly a trip for the day before the plane home to get some last minute gifts for the family! No trip abroad will be complete without trying a few of the home dishes. 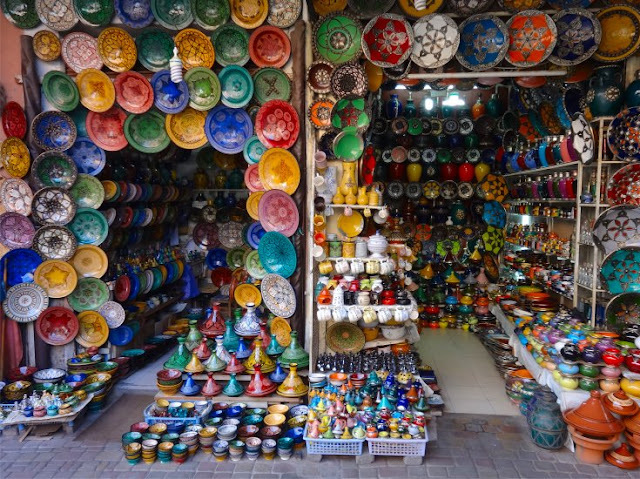 Marrakech is no different, with restaurants and cafes dotted all around the city as well as stalls in the marketplace selling hot and cold snacks alike. You might have to search a bit for the best deals, but the food is certainly worth paying a little extra for if you don’t want to wait. 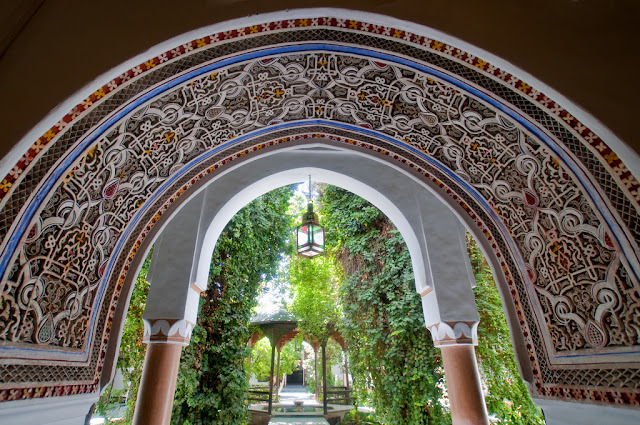 Riads are refurbished classical Moroccan homes with all the modern luxuries we have come to know and enjoy. Like a modern version of a traditional Moroccan hotel, Riads can be themed to their local area, often come with an accompanying pool and roof terrace and are very fancy for the price. Worth it for an evening or two in an authentic Moroccan hotel. Saadian Sultan Ahmed al-Mansour ed-Dahbi imported Italian marble to make the glorious mausoleum known as the Chamber of the 12 Pillars. Neglected until the start of the 20th century, these chilling tombs are remnants of a rich Sultan desperate to immortalise himself in the world. A stark contrast to the warm sunny yellows and reds of the rest of Marrakech, the Jardin Majorelle is a beautiful green garden open to all. Boasting over 300 plant species from five different continents, the café provides a beautiful view of the garden over snacks and coffee. Those with a bit of spending money will enjoy the garden’s boutique. Just wandering the streets of Marrakech can be an adventure in itself. Due to its huge array of twisting alleyways, curves and corners and little side-streets, it almost seems like a labyrinth of wonder to explore. There are a huge number of cheap local cafes and restaurants if you know where to look. Straying a little ways off the beaten path will net you snacks or nice lunches at a good discount from the main street, although you might want to invest in the help of a local tour guide to find the best places to eat. Marrakech is a city with intense cultural history. With the old Riads, the stretching classical buildings and the beautiful mosques of Marrakech, your camera will certainly have its work cut out. The Koutoubia Mosque is Marrakech’s most famous symbol and while non-Muslims may not enter this place of worship, its exterior still creates a stunning vision when surrounded by the other buildings in the Medina. If the snacks of Marrakech have tickled your taste buds, why not have a go at cooking them for yourself? A number of riads provide cooking courses for their residents, giving tourists a hand at the reigns at preparing and cooking their very own Moroccan dish. With so many delights in store for those wishing to go to Marrakech, it is no surprise that it is an extremely popular tourist destination. With sun, sands and a plethora of activities for adults and kids alike, open up your eyes to the delights of a Marrakech holiday today!